Over the years SOAR team members have donated their resources in service to non-profit organizations addressing a broad spectrum of community needs. We consider it our duty as responsible citizens to invest our time, our money, and ourselves to create a lasting impact in our community. We feel so strongly about this that we provide our associates with paid time off to support their favorite charity. It’s just the right thing to do for our associates, our company and our community. Kelsie Garin has been involved in volunteer work for several years, but most notably as the Treasurer of both a gymnastics’ booster club and a boys’ soccer team over a span of six years. Her desire to give back to the organization’s that added such value to her children’s lives was the reason she stepped in to help. Kelsie felt that providing strong fiscal policy to the organizations would ultimately help all of those involved on the teams including parents, players and coaches. Neal Smith and his wife Luanne have been committed to youth athletics in Prince George’s County Maryland for over twenty years as coaches, volunteers and officials. In recent years the county has lost its intramural fastpitch softball leagues. Neal and Luanne have held open clinics to assist those who would like to learn the game. They have been recognized by the city of Cheverly Maryland for paying to maintain a softball field, and in 2017 donated 50% of the cost of a new batting cage for Bowie High School. Their program has helped many young women use sports to prepare for bigger goals in life. Today some of their former players are doctors, lawyers, teachers, and scientist. All are contributing to their communities, and many have come back to help other young woman through the game. Neal Smith and his wife Luanne established a merit based scholarship for young women to attend parochial school. This scholarship has provided at least six young women in the last eight years to gain entry to schools such as Elizabeth Seton and McNamara High Schools. Recipients have gone on to graduate near the top of their respective classes, complete their college degrees, and give back to their own parishes by continuing the spirit of excellence and volunteerism. Neal Smith is an activity member in his local community and parish. He has his wife Luanne orchestrate and execute two pancake breakfasts a year for their local parish (feeding over 400 annually). They donate/prepare the food, and pull together volunteers from local schools, enabling these student volunteers to receive community services hours required for high school graduation. Over the past 10 years these events have raised $5,000 annually for the parish ministries to help young mothers and families in need. The Fairfax High School (FHS) Athletic Booster Club is an independent organization dedicated to providing financial support to the Activities Director, athletic teams, coaches, and student athletes associated with Fairfax High School. 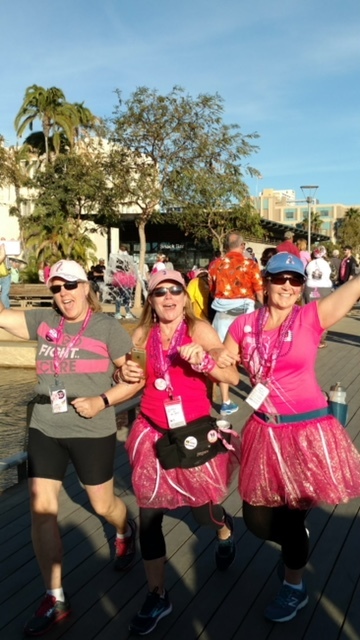 Susan Barborek recently participated in the Susan G. Komen Avon 3-Day walk for breast cancer research. She raised over $2,500 as she walked 60 miles over 3 days in San Diego California. Bruises on her ankles and sore feet did nothing to damper the spirit of Susan and her walk mates!